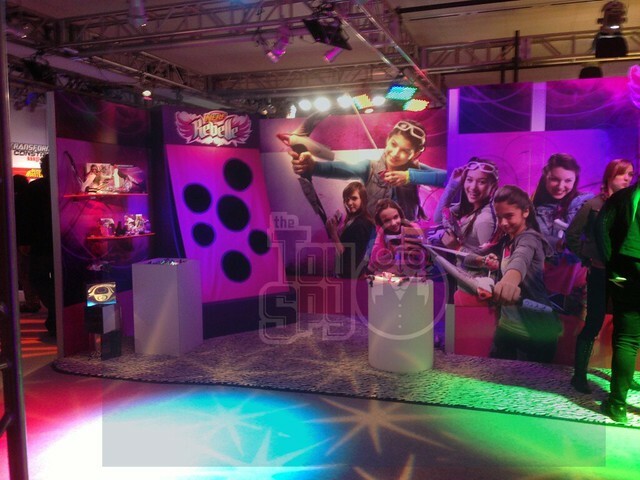 Hasbro delivers major girl power this fall with the launch of the NERF REBELLE brand. Combining active play with social interaction, the global lifestyle brand provides girls with a new play experience. Inspired by current pop culture trends and based on insight from real girls, the NERF REBELLE brand is designed to empower players with confidence, high performance action, and a stylish edge. From sleek and powerful crossbows to trend setting accessories and a digitally enhanced world of app play, the impressive NERF REBELLE lineup delivers the ultimate in social active play and gaming adventure, encouraging players to work together, complete missions, and share the fun with friends. Hasbro will expand the NERF REBELLE offering later this year as the brand enters new categories including apparel and accessories. It’s time to Step Up and Stand Out. The ultimate adventure accessory, the NERF REBELLE HEARTBREAKER bow features “true” bow action and powerful dart performance! Inspired by current pop culture trends, the HEARTBREAKER bow offers girls the poise and precision to take on any mission. To activate the bow, simply load a dart in the front and take aim. Then, pull back on the bow string handle and release to send darts soaring across the sky up to 75 feet, allowing for shot that shows off your skill with aim and attitude. Ready for action, the bow features an accessory rail which provides for five-dart storage for easy access to ammo and allows girls to customize their blaster with fun add-ons, like the NERF REBELLE Mission Central App Cradle (sold separately). 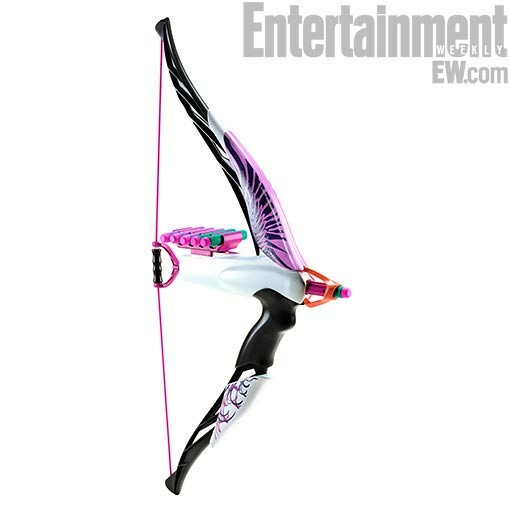 The NERF REBELLE HEARTBREAKER bow comes with five collectible darts, Available at most major retailers nationwide and on HasbroToyShop.com. Girls can grab a group of friends and experience the ultimate social adventure together in an App-enhanced world of the NERF REBELLE brand! To start the fun, fans can download the free NERF REBELLE MISSION CENTRAL App to their iPhone or iPod Touch, and insert the device into the stylish NERF REBELLE MISSION CENTRAL App cradle accessory. Attach the accessory to a compatible NERF REBELLE blaster (sold separately) and then it’s time to bring friends together for some serious fun! Within the app, players can create a personalized avatar and form squads with friends for multi-player gaming. NERF REBELLE players can capture photos and videos while in play, and even share the fun with friends. Players can also go on quests, compete to win in-game benefits, and even earn accessories for their avatar within the app. The NERF REBELLE MISSION CENTRAL app will be available for download at the App Store and compatible with the iPhone 4, iPhone 4S, iPhone 5, and iPod Touch (4th Generation). Compatible with select NERF REBELLE blasters. Available at most major retailers nationwide and HasbroToyShop.com. I thought I would make this a separate post from the Toy Fair post in order to flesh out the Rebelle info a bit more. As for the Mission Central App, I believe it’s supposed to be free, and the price is referring to the cradle package accessory. I’m not actually at the Toy Fair in NYC, so this is all information thats hit parts of the net. 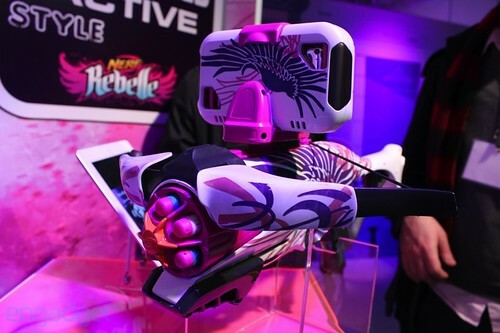 Photos of the Rebelle line, new blasters (Blazin’ Bow and Revonix360!) and a look at a small at a new, un-named Vortex line are all below. Feb 13, 2013 9:49 PM EST: The Toy Spy’s video look at the Rebelle line. The video is fairly good quality, so I thought I’d post it here. Feb 10, 2013 5:00 PM EST: Engadget has some nice photos of the Rebelle line on their site. Be sure to check em out! Feb 10, 2013 3:00 PM EST: Foam From Above gets a demo explanation video on how to load the Revonix360. Drum does not come out, you load it through a slot on the side and rotate the drum. It was prototype so asked to not fire it, but WILL shoot further than previous vortex. Feb 10, 2013 2:08 PM EST Photos thanks to Foam From Above. He’s got some mobile shots on his blog, and he’ll put up more shots later. 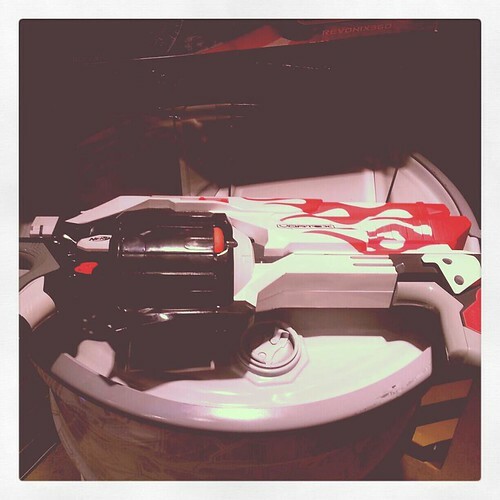 Feb 10, 2013 1:37 PM EST: Foam From Above video firing off the Rebelle Wildshot. Revolver action baby! Feb 10, 2013 8:30 AM EST: Hands on video of the Nerf Cyberhoop. Thanks to Engadget. Feb 9, 2013 EDIT 11 PM PST: Video from Toy Spy, in which we get a closer look at the Blazin’ Bow and Revonix360. The Blazin’ Bow is fired, but the Revonix360 is not. Also, check out the new designs on the Vortex line. I didn’t see anything about new range claims or anything tooo new about the line, besides the recolors. Keep reading to see more images, and stay tuned to the blog for more info! Wow, Entertainment Weekly has broken the story off a big piece of news. 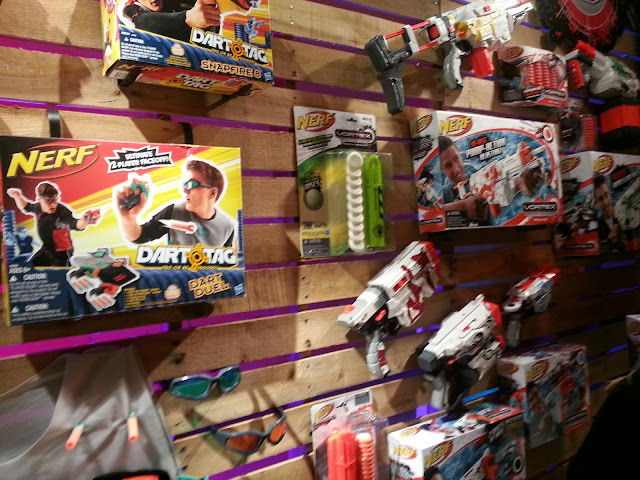 Nerf is launching a line aimed at girls, and what they want. You can view the original article here, but I’ve also copied and pasted for archive purposes and a quick read. My Last Dart is also sitting in on a conference and has some exclusive news as well. I’ll be sure to gather it all in a post and post it here, along with my thoughts, once the conference is over and I gather everything. What do you think about this new line aimed for the female audience? Hasbro is hoping to hit a bullseye with its next high-profile launch — a new brand of Nerf toys aimed specifically at girls. The line, called Nerf Rebelle, will feature projectiles that have the same power as the top items in the brand’s Nerf Elite line — but come wrapped in a prettier package and designed to encourage the collaborative play Hasbro has found girls prefer. Aspiring Princess Meridas and Katniss Everdeens can own the first Rebelle product — called the Heartbreaker bow — this fall. Rebelle immediately brings to mind Lego Friends, a new line of female-driven products that helped to increase Lego’s profits by 36 percent last year — even as critics accused the toy company of promoting gender stereotypes. But John Frascotti, Global Chief Marketing Officer of Hasbro, says that his corporation isn’t worried that Rebelle pigeonholes girls or reinforces the ideology of separate spheres. “I think if anything, we went into this without any stereotypes and instead talked to young girls, found out what they wanted, and then designed a line of products that addressed that opportunity,” he told EW in an interview, saying that Hasbro did research for over three years while creating the line. Thanks to all that research, Rebelle differs from other Nerf lines in several key ways. The Heartbreaker bow comes with collectable darts bearing different colors and designs; there’s a Rebelle app that allows girls to play collaboratively and encourages teamwork; the bow’s size and ergonomics have been tweaked so that girls as young as 6 can activate it easily. The product’s main philosophy, though, is in line with that of the Nerf toys that came before it. “Nothing is really addressing this big opportunity for girls to be active and play,” Frascotti said. “Parents are concerned about the amount of time kids are spending in sedentary activities, in front of a screen of some sort.” By contrast, Rebelle promotes exercise and socialization in a way that will hopefully appeal to girls who have no interest in sports as well as budding athletes.